The Global Livability Index 2018 (Economic Intelligence Unit/Economist Magazine) ranks Karachi at 137 out of 140 global cities. Why does the country’s economic hub, recording the highest national literacy rate suffers this indignity? 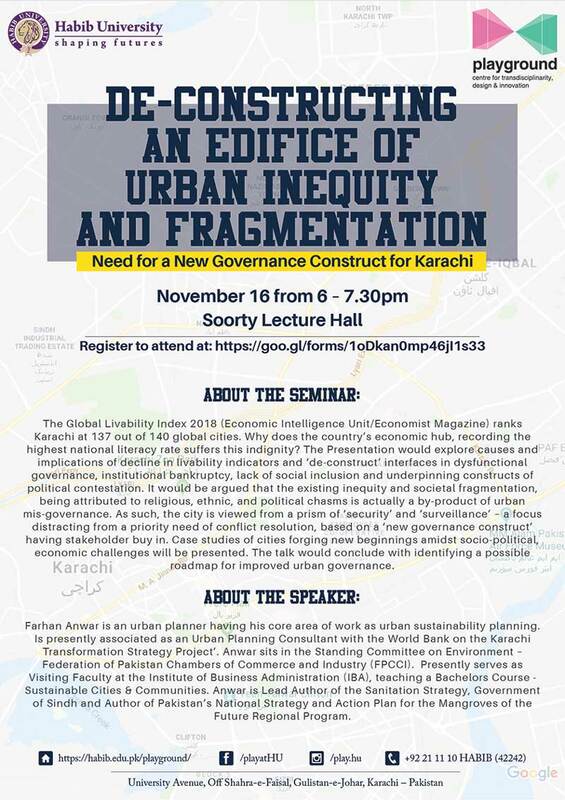 The Presentation would explore causes and implications of decline in livability indicators and ‘de-construct’ interfaces in dysfunctional governance, institutional bankruptcy, lack of social inclusion and underpinning constructs of political contestation. It would be argued that the existing inequity and societal fragmentation, being attributed to religious, ethnic, and political chasms is actually a by-product of urban mis-governance. As such, the city is viewed from a prism of ‘security’ and ‘surveillance’ – a focus distracting from a priority need of conflict resolution, based on a ‘new governance construct’ having stakeholder buy in. Case studies of cities forging new beginnings amidst socio-political, economic challenges will be presented. The talk would conclude with identifying a possible roadmap for improved urban governance. Farhan Anwar is an urban planner having his core area of work as urban sustainability planning. Is presently associated as an Urban Planning Consultant with the World Bank on the Karachi Transformation Strategy Project’. Anwar sits in the Standing Committee on Environment – Federation of Pakistan Chambers of Commerce and Industry (FPCCI). Presently serves as Visiting Faculty at the Institute of Business Administration (IBA), teaching a Bachelors Course – Sustainable Cities & Communities. Anwar is Lead Author of the Sanitation Strategy, Government of Sindh and Author of Pakistan’s National Strategy and Action Plan for the Mangroves of the Future Regional Program.